John Cameron is that rarest of men… one who has risen to the top not only in the world of preservation but in the professional rail industry, too. 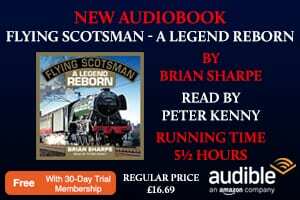 Not only does he own two of Britain’s best-known steam locomotives – Union of South Africa and The Great Marquess – but he has been chairman of ScotRail, a member of the British Railways Board and a director of South West Trains. There was also the small matter of the Lochty Private Railway! EVERY rail enthusiast has a dream, but few are able to turn it to reality as successfully and dramatically as John Cameron. John has been called ‘the union man’, for he not only owns the ‘A4’ Union of South Africa, but is a former president of the National Farmers Union in Scotland. 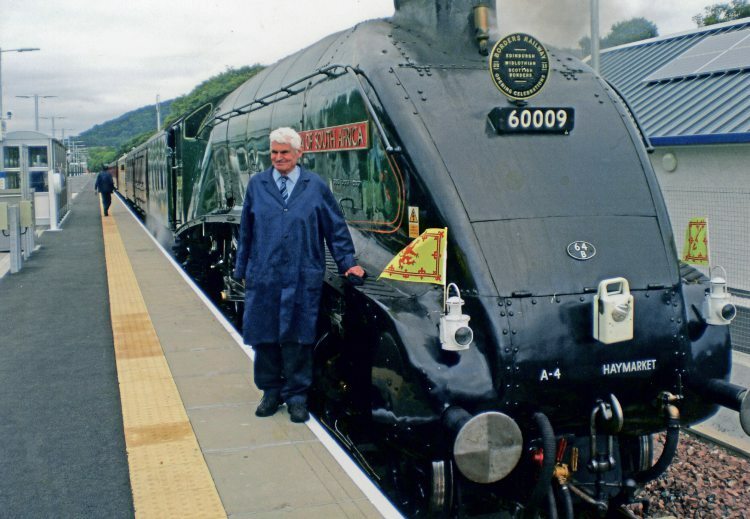 One of the best-known personalities in the world of railways, he has spent his life combining a passion for trains with a penchant for farming, and his name has been synonymous with the rail system north of the border for half a century. John first burst into the public eye with his purchase of Gresley Pacific No. 60009 and the ex-BR Lochty branch within a few weeks of each other in the summer of 1966 and, two decades later, became the man who controlled his country’s national main line network as chairman of BR Scottish Region. 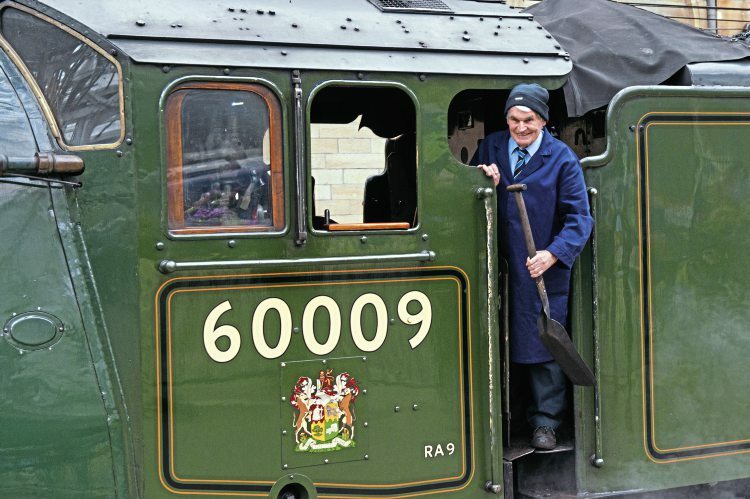 As a result, he has amassed countless ‘memories of a lifetime’, but the moment he cherishes most arrived on September 9 last year when his immaculate locomotive – with him at the controls for part of the way – hauled HM The Queen along the newly reopened Waverley route from Edinburgh to Tweedbank. After arrival, he and his fellow crewmen were formally introduced to the monarch on the platform of the new terminus. “It was my proudest day for two reasons. Firstly, because my engine had been entrusted with conveying the Queen on the day she became the longest-serving British monarch of all time and, secondly, because we were reopening a major part of Scotland’s rail infrastructure,” said John as we settled into his study surrounded by railway paintings and photos of every description. Fortunately, the ‘hard times’ in John’s life have been outnumbered by great good fortune in his business affairs, enabling him to not only buy one of Britain’s most magnificent locomotives, but to keep it running and to double the size of his fleet a few years ago with the purchase of another LNER thoroughbred, ‘K4’ 2-6-0 No. 61994 The Great Marquess. Both are today allocated to the former diesel depot in the old Thornton marshalling yard, just a few miles from John’s home, and have built up deserved reputations as two of the most popular locos on the main line railtour circuit. Railways have been a part of John’s life since his formative years, although both parents were from agricultural families – his father from a Perthshire hill farm and his mother from a large arable holding in Fife. Born on June 14, 1939, less than three months before the outbreak of the Second World War, he grew up on the latter farm and attended school at nearby Elie, a small town on the Fife coast. In those pre-‘Beeching axe’ days, Elie lay on the ex-North British Railway Fife Coast Line from Leven to Leuchars Junction, and the produce from the Camerons’ farm was handled in the goods yard at nearby Kilconquhar station. As a young boy, John would often help out with this work, but it wasn’t long before his interest began to expand from sugar beet and potatoes to embrace ‘Scotts’ and ‘Glens’. St Andrews and to the engine shed at Anstruther, a sub-shed of 62A Thornton. There, he got to know the other crews and was shown how the various types of loco worked and were maintained. What his parents might not have quite realised, though, was that their 12-year-old boy was not pottering about on the branch lines of Fife as they imagined, but was often almost 50 miles away in the capital city of Edinburgh! John explained: “On Saturday mornings, the local engines would be taken to Thornton, or sometimes to Haymarket depot, to be changed for fresh ones and some of the crews would let me ride with them all the way to Edinburgh to collect the new engines and bring them back to Anstruther. In his early teens, John was sent to boarding school at an academy in Dollar, a few miles east of Stirling, but he never lost his special relationship with the Fife crews, and during school holiday time would resume his clandestine footplate trips and signalling duties. 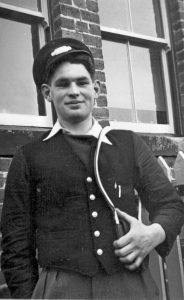 In fact, by the time he was in his late teens and early twenties, he had got himself fully kitted out with a British Railways uniform and cap and was being treated by the local railwaymen as ‘one of them’, even though he wasn’t on the payroll! 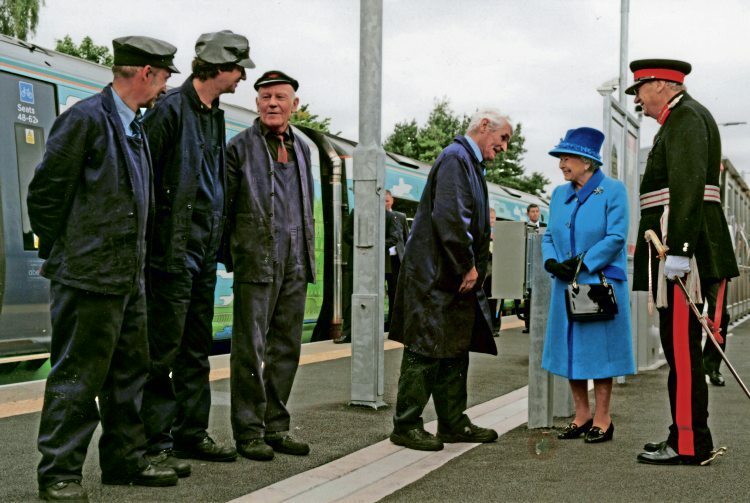 “The proudest moment of my life”: John is introduced to Her Majesty the Queen after his Pacific had hauled her train along the reopened Waverley route on September 9, 2015 – the day she became the longest-serving British monarch of all time. Proof of this extraordinary relationship comes from the train register book of Glenoglehead signalbox, which stood on the ex-Callander & Oban line in what was then Perthshire. Blowing the dust off the book’s cover, John proudly shows me the page for June 22, 1963. There, at 3.57pm, is an official Rule 55 (train standing on running line) entry signed by the locomotive’s ‘fireman’ – John Cameron! It’s not the only time John’s signature appears in the register, showing not only that he was being trusted by drivers to perform such important operational duties, but that his ‘work’ was taking him to the mountainous central and western areas of Scotland, a helluva long way in railway terms from Fife. Such was the wonderfully informal atmosphere on the railway in those days – especially on the Scottish Region with its reputation for running a safe and efficient operation, while maintaining a friendly and relaxed attitude towards authority. 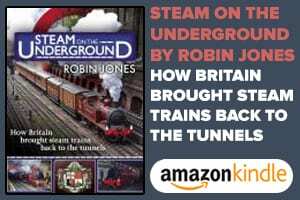 Given that he was virtually a railway employee anyway and knew his way around the workings of locomotives and signalling systems blindfolded, it would have been natural for John to have formally entered the industry after leaving school, but it was to be aviation that then entered his life. For he won a flying scholarship and moved hundreds of miles south to Lincolnshire to live and study at the Royal Air Force training college at Cranwell, near Sleaford. Hard though it might be to believe, John managed to ‘work’ for British Railways (sometimes as a signalman, sometimes as a fireman) even though he was never on the staff! Here he is with the single line token at Elie signalbox in the 1950s. “I suppose if I’d stayed with the RAF, my life would have turned out very differently, but in the early-1960s, my father decided to retire and so I took the decision to return permanently to Scotland to take over the running of the farm,” said John. At about that time, John had fallen in love with Margaret, a South African-born girl he’d met while she was working as a nurse in Edinburgh, and they had married in 1964. “Margaret doesn’t mind me saying I’d also fallen in love with the Gresley ‘A4’ Pacifics,” he smiled. “I had seen them many times in Haymarket shed in the 1950s, of course, and had travelled behind them on journeys to Lincolnshire, but at about the time of my return to Scotland, things really began to get interesting. The ‘A4s’ transferred north in October 1963 were Nos. 60006 Sir Ralph Wedgwood, 60007 Sir Nigel Gresley, 60010 Dominion of Canada, 60019 Bittern, 60026 Miles Beevor, and 60034 Lord Faringdon. 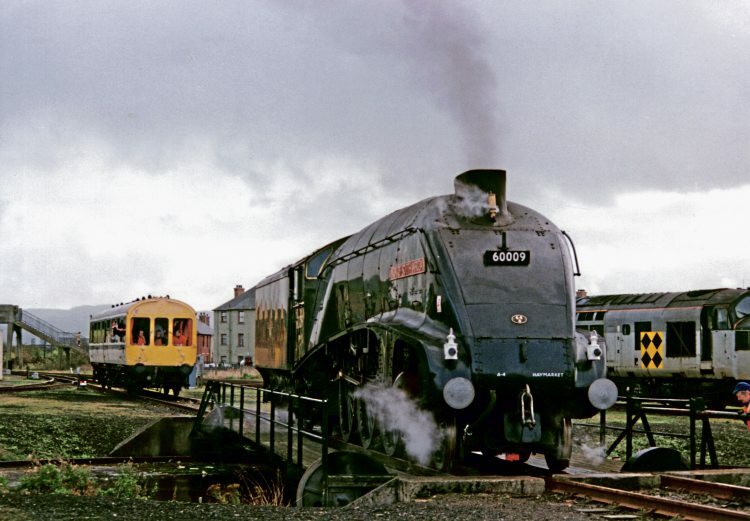 They were to complement some of the Scottish Region’s own ‘Streaks’, such as 60004 William Whitelaw, 60009 Union of South Africa, 60016 Silver King, 60024 Kingfisher, 60027Merlin, and 60031 Golden Plover. St Rollox ,with a standby loco sometimes out-stationed at Perth. “It was an extremely exciting time for people like me,” recalled John, exhilaration still discernible in his voice all these years later. That glorious ‘Indian summer’ of the LNER thoroughbreds was to last almost three years, until the autumn of 1966, but inroads into their ranks through withdrawals had continued to take place, and at the beginning of 1966 came rumours that the three-hour services were to be taken over by BRCW Type 2 diesels (later Classes 26 and 27), and that the Scottish-allocated ‘A4s’ were all likely to be towed to breakers’ yards later that summer. “This was dreadful news,” said John. “I felt I had to do something. Photographs on the goods-only Lochty branch in pre-preservation days are rare. 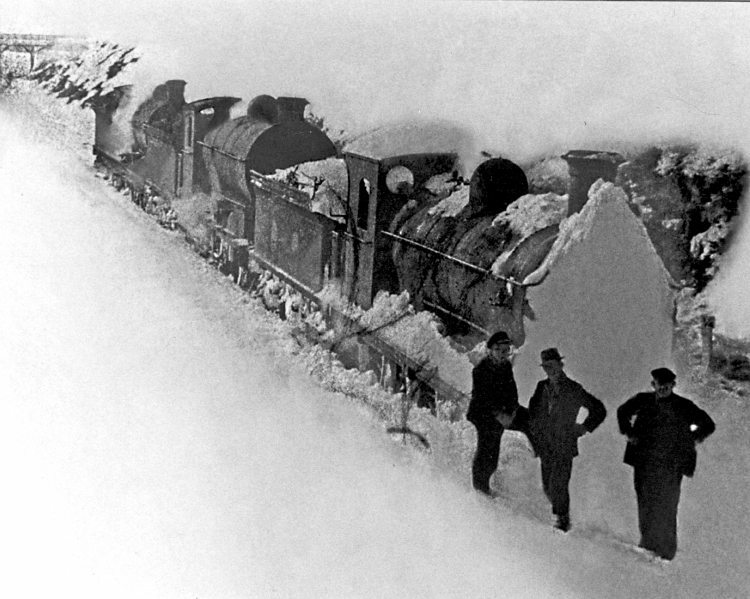 This scene from John’s boyhood depicts the rescue of a snowed-in LNER 0-6-0 during the harsh winter of March 1947. “One of the railwaymen I’d got to know well during my earlier footplate days was the foreman fitter at Ferryhill depot, a man by the name of Jock Tosh, so I asked him which Pacific he considered to be the best. Encouraged by this staff loyalty to steam at the expense of a state industry (fellow loco owner David Shepherd received similar unofficial bonuses when he bought ‘9F’ No. 92203 at about the same time – The RM November 2002), John decided he would take the plunge and buy No. 60009. Before deciding to name No. 4488 Union of South Africa, the LNER had allocated it the name Osprey and the loco actually entered the Doncaster Works paint shop in 1937 bearing Osprey plates. These were later acquired by John Cameron and when, in 1990, he came under political pressure to temporarily rename the loco during anti-apartheid protests, the plates were re-fitted. No. 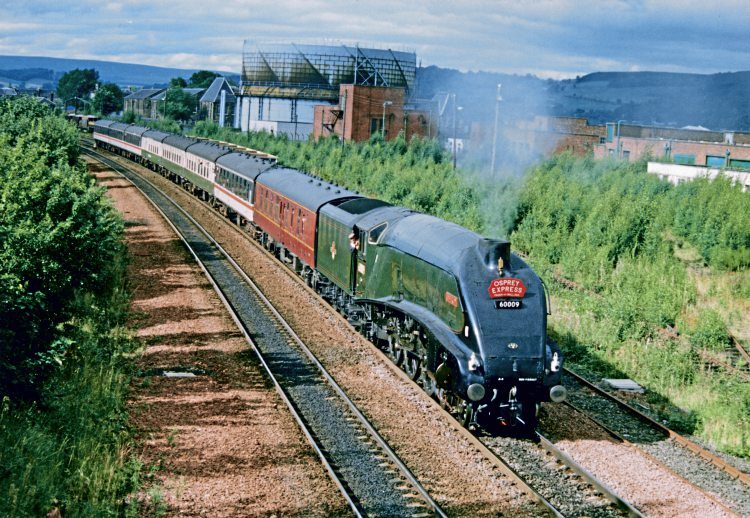 60009 is seen leaving Stirling with a suitably-named express. So far so good, but John didn’t really know where he was going to keep 160-odd tons of locomotive and tender. It was at that point that he experienced one of those happy and serendipitous coincidences that sometimes occur in life, for at almost the same time as he was agreeing to buy the ‘A4’, the agricultural side of his business got the chance to buy a farm that just happened to have an old railway running through it. It was a two-mile section of the single-track former North British Railway branch from Leven to Lochty, and John’s new land included the Lochty terminus, complete with goods yard and associated buildings. 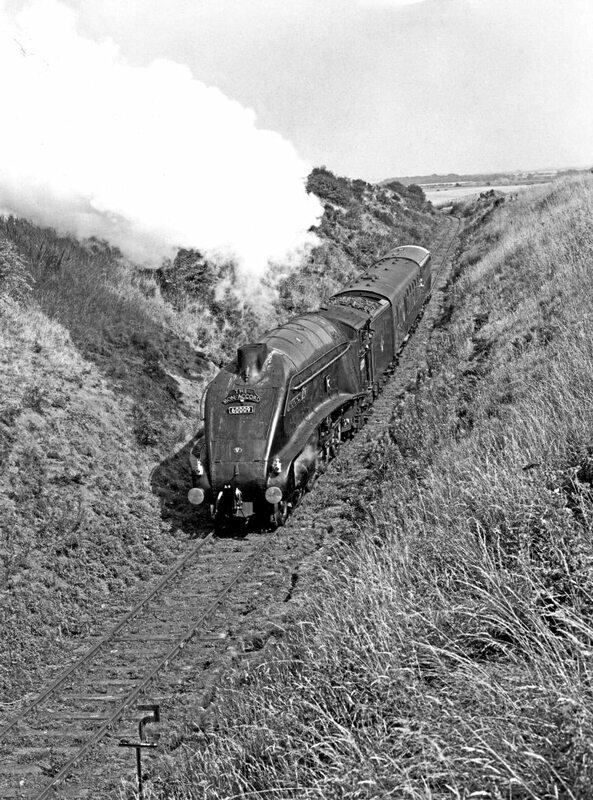 By law, British Railways had to give first refusal of trackbeds to adjoining landowners and, of course, most who took up the offer did so in order to plough the formation back into the neighbouring fields. John, however, surprised BR by telling them he would buy the trackbed on condition they left the rails and sleepers in position. 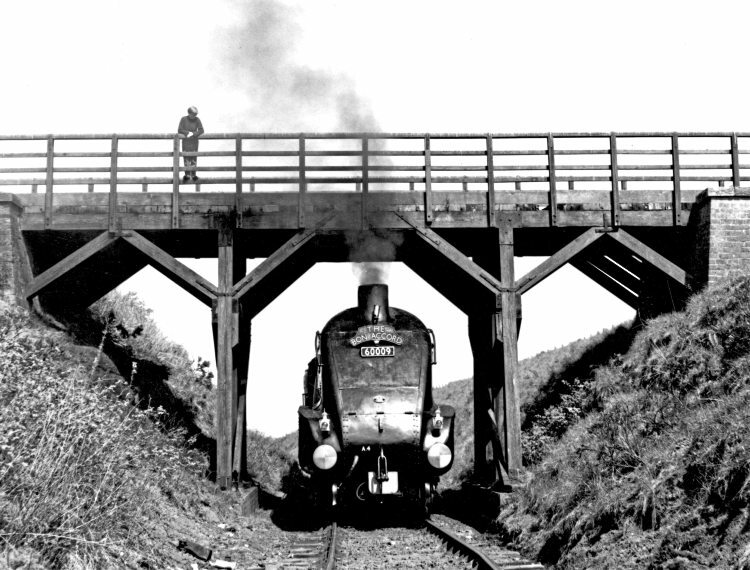 The 14-mile branch line was goods-only from its inception as the East Fife Central Railway in 1898, apart from a couple of years of workmens’ trains to local collieries just before the First World War, and was laid on ash ballast throughout; it probably never saw anything larger than LNER ‘J35’ or ‘J36’ class 0-6-0s in its entire history. The purchase was agreed in July 1966 for just £150, and John suddenly found his streamliner storage problem solved. As a section of the Lochty branch at its junction end had already been lifted, he agreed to pay an extra £500 to have Number 9 towed by diesel shunter to Crail, a station on the closed, but still intact, Fife Coast Line, six miles by road from Lochty. After the loco purchase had gone through, also in July 1966, ‘No. 9’ was moved to Thornton depot in Fife for preparations to be made for the transfer to Crail, but while it was still at Thornton, John received a phone call from BR informing him that one of the Stanier ‘Black Fives’ booked for the Scottish Region’s double-headed ‘farewell to steam’ tour in March 1967 had failed, and how much would he want paying for BR to hire Union of South Africa back for the day? “I was tempted to quote them £4,500,” laughed John, “but I told them they could have it for nothing as long as they provided the coal and water and let me ride on the footplate. “It was an experience I will never forget. The train was loaded to no fewer than 18 carriages and we reeled off the 89 miles from Perth to Aberdeen in just 87 minutes. Not bad hauling 18 packed coaches… and pushing a ‘Black Five’ as well,” he said tongue in cheek! “We then ran light to Perth in order to take it from there into Edinburgh over the Forth Bridge. “There was a humorous incident while we were waiting at Perth. The driver and fireman had gone for a break, leaving me alone on the footplate to mind the engine, when a BR inspector, complete with the traditional trilby hat and long dark mac, swung himself up into the cab. “Assuming I was the fireman, he asked me if I’d heard that some farmer chap called Cameron had bought the loco? As chairman of ScotRail between 1988 and 1996 (an episode of John’s life that will be covered in Part 2 next month) he sometimes used No. 60009 to haul the Scottish Region directors’ saloon on official inspections of the network. Here, the Pacific is seen on the turntable at Perth. he was invited to sit in on a panel preparing to interview a shortlist of three candidates for the position of chief traction inspector. Having just bought ‘A4’ Pacific No. 60009 Union of South Africa from British Railways, John Cameron was making plans to transport it from Thornton depot to his remote Scottish farm for preservation when, out of the blue, came a call from BR asking him if they could hire the engine back for a Scottish Region ‘farewell to main line steam’ special. He was delighted to agree, especially as the deal allowed him to ride on the footplate, and the trip was a huge success. Once that unexpected bonus was over, a BR 350hp diesel shunter hauled the loco in April 1967 from Thornton to the Fife coast outpost of Crail, from where it was taken by low-loader along six miles of narrow winding lanes. 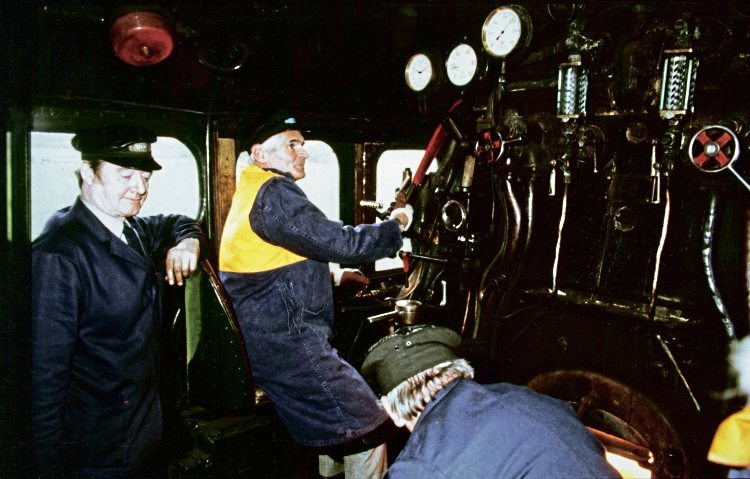 John is in his element on the footplate of ‘Number 9’, having first driven it half a century ago. That was an experience in itself, for the roads had to be closed to all other traffic by the police. At the time, there was no intention of operating a train service along the Lochty line, which ran for two miles across farmland John had recently bought. He simply planned to erect a shed in which to keep the ‘A4’ safe and dry, and perhaps occasionally display it to visitors, but local goodwill was such that fellow enthusiasts came forward to help him care for it, and that led to the birth of the Lochty Private Railway (LPR), one of the first heritage lines in Scotland. BR’s contractors had already lifted most of the single-track branch by the time John acquired the formation, but he recalls managing to save the last three-quarters of a mile or so at the Lochty terminus end. Ably assisted by volunteers, including members of what became the Fife Locomotives Preservation Group, he had an engine shed erected by a local blacksmith and paid the National Coal Board for some redundant track from a local colliery… enough to provide a decent stretch of running line. Public operations began in 1967. Although always a small enterprise compared with some heritage lines, it was further extended to the edge of John’s land in 1970 and, two years later, attracted a healthy 7,000 visitors. The big draw, of course, was the immaculately presented ‘A4’, which trundled in extremely incongruous fashion through the fields towing a couple of coaches John had acquired, one of which was a prestigious LNER ‘Beavertail’ observation car. That year of 1972 turned out to be the last big one for the LPR, for the previous year had seen British Rail start to lift its notorious ban on main line steam, and John realised that his ‘racehorse’ would once again be able to gallop along inter-city routes rather than trot in and out of what was effectively a farmyard stable. He applied for Number 9 to be mechanically checked by BR and when it passed all the tests, the engine that had brought the curtain down on main line steam north of the border in 1967 was ready to raise it again in 1973. It was low-loaded to a main line connection at Ladybank and the volunteers of the Fife locos group, having lost the LPR’s raison d’etre, used the same lorry to bring in ex-Wemyss Private Railway No. 16, an ex-Scottish colliery 0-6-0 that would at least keep steam trains running on the Lochty line. In fact, the railway managed to remain in operation until as late as 1992 before the operators re-constituted themselves as the Kingdom of Fife Railway Preservation Society and moved the collection to the coast at Methil in 1993. After a period in store, they are now based in the town’s Kirkland yard and are once again open to the public, although John is no longer involved. As for Lochty and its terminus, it has reverted to farm use and only the old goods platform survives. Once back on the main line, a new home had to be found for Number 9 that was handy for John’s home, near Kilconquhar. At first, it was kept in Kirkcaldy goods shed for three years until that building’s demolition, then Markinch goods shed until 1994, but in May that year it was moved by low-loader to Bridgnorth depot, on the Severn Valley Railway, becoming in the process the first steam locomotive to cross both Forth bridges. Today, it is back in Fife and kept in the former English, Welsh & Scottish Railway diesel depot at the otherwise moribund Thornton Junction marshalling yard. Sharing space in the two-road shed whenever it’s in the area is ‘K4’ No. 61994 The Great Marquess (formerly LNER No. 3442). That Gresley loco was one of a small fleet designed specially for the tortuous West Highland Line and was saved from the scrapman’s clutches in 1961/62 when Viscount Garnock bought it from BR. 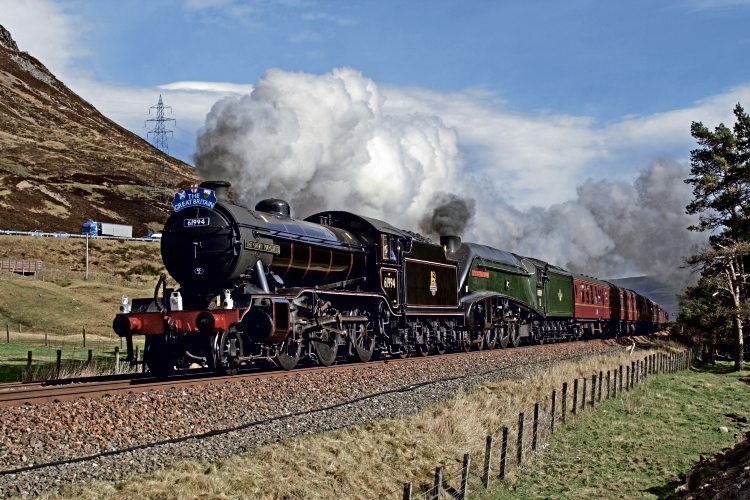 It has since enjoyed a long and successful preservation career on both main and preserved lines, and when it became available for purchase in the mid-2000s, John stepped in to ensure it retained its Scottish connection and operational status. 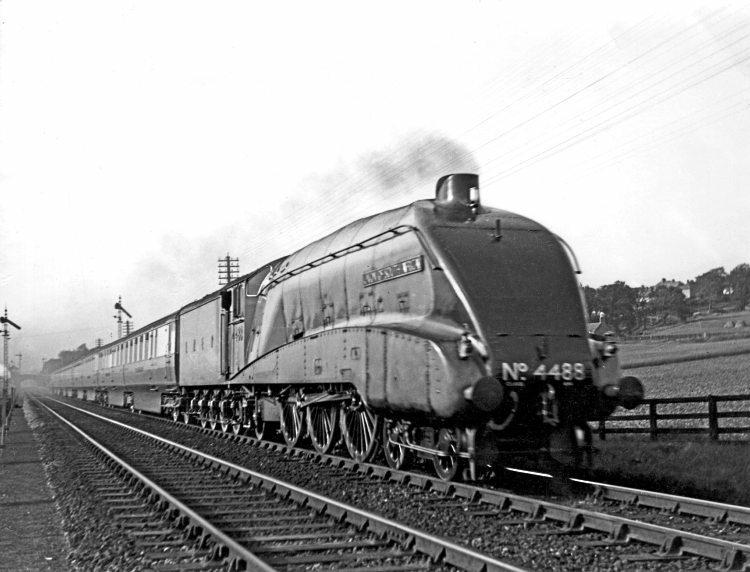 Although former Flying Scotsman owner Alan Pegler had been a member of the Eastern Region board in the early 1960s, he’d been obliged to step down under pressure from BR chief Richard Beeching after buying the ‘A3’ and, for years afterwards there was an unwritten law within the BR corridors of power that staff keen to further their careers didn’t admit to being steam fans. So, given that, how on earth did John Cameron – in his own words “a humble farmer and rail enthusiast” – become a member of the BR main board and chairman of ScotRail? For the answer to that, we have to go back to the mid-1970s. other farms in Fife and Perthshire that he was credited with being the biggest sheep farmer in the whole of Europe! Not only was he a consummate businessman, but he had proved himself a shrewd and feisty negotiator. A sight familiar to preservationists in the late 1960s/early 1970s, but now very much consigned to railway heritage history: Union of South Africa on the Lochty Private Railway. In the mid-1970s this drive and determination saw him elevated to the presidency of the National Farmers Union in Scotland. Britain had just joined the European Union and John had become chairman of the EU sheepmeat committee. As such, he was regularly having to fly to Brussels once a week to represent farmers, leaving the farm in the capable hands of wife Margaret. Among the many politicians he came to the notice of was the Secretary of State for Scotland, George Younger, who admired his communication skills and ‘no-nonsense’ approach to life. Younger was keen to offer him more senior and influential positions in the world of agriculture but John – who was awarded a CBE in 1986 for services to agriculture – was beginning to miss practical day-to-day farming and so turned them down. “One day I received a summons to go and see Mr Younger in Edinburgh and he asked ‘What have I done to upset you – you’re not taking any of my job offers’. I explained why and he asked me what else I was interested in. John didn’t need much persuasion to take that job, especially as it was a part-time role that would leave him time for farming. He also became a Scottish member of the main British Railways Board, being required to spend one day a week as chairman and one day a week on the board in London – positions he held from the late-1980s until rail privatisation in the mid-1990s. Framed by a timber footbridge, Number 9 makes an incongruous sight with ‘The Bon Accord’ headboard on the Lochty Railway. That titled train ran regularly between Glasgow and Aberdeen in LMS and BR days. The locomotive carries a 62A (Thornton) shedplate. Being a wealthy man in his own right meant he didn’t actually need the jobs either, which gave a large degree of independence to the Scottish Region (or ScotRail as it was known in marketing terms by then). Not only was he chairman, but he decided to head the safety committee too and in order to ensure he was master of that role, he put himself through a full BR diesel driving course, not only to complement his steam driving knowledge, but to help him understand the challenges faced by the crews on his Region. One of the first calls made on the new chairman’s reputation for feistiness and ‘getting things done’ occurred when his operating department advised him that safety was being compromised by trees and branches overhanging the main line between Inverkeithing and Aberdour. This was a threat both in an obstructive manner and from a sighting point of view, so the chairman authorised diversions and a weekend line closure to enable a civil engineering team to go in and blitz the route. “With all the preparations made and all the men and plant ready, I heard from our head office on the Friday that a conservation group had got wind of our plans and had taken out an injunction to stop the work because some bushes with a weird Latin name were in danger of being cut down! “They’d deliberately waited until Friday afternoon to do this as they knew that the courts wouldn’t sit on a Saturday to enable us to appeal. I flew into a rage when I heard because I took the view that the safety of drivers and thousands of passengers was far more important, so I decided that this was a case for pulling rank. I phoned George Younger and told him that if the branches weren’t cut, I would have no alternative but to put a complete stop on all the trains along that route into Edinburgh on Monday morning. One of the most bizarre photographs ever published in a railway periodical! 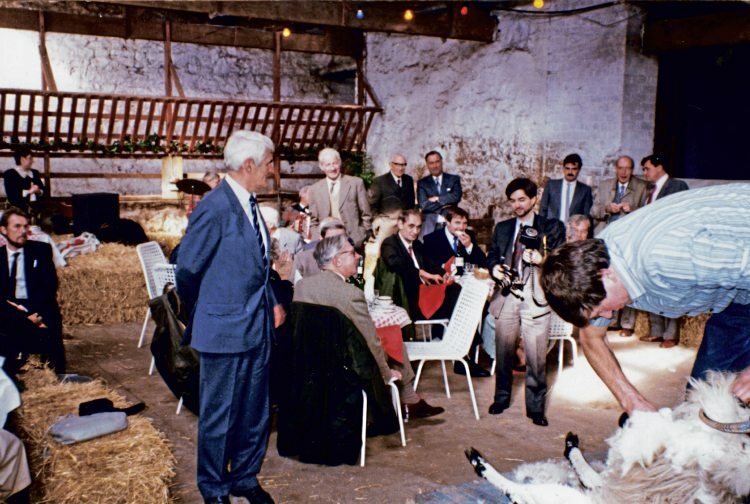 During his tenure as chairman of ScotRail, John invited British Rail chairman Sir Bob Reid and the rest of the BR board to his Scottish farmhouse, put them in a barn… and presented them with a sheep-shearing demonstration! Another incident that occurred during his tenure was more humorous and had shades of the inspector incident at Perth, described in Part 1. John explained: “Number 9 had been out on the main line, but there had been a delay and it was very late at night by the time we were ready to set off light engine from Edinburgh back to Thornton shed. So I let the driver and fireman go home and decided that myself and the inspector (whose car was at Thornton) would take the loco back with a member of the support crew acting as fireman. “All went well until we got onto the Forth Bridge when the stand-in fireman peered into the tender with a torch and announced that it was completely empty! “We’d only got the coal that was on the grate – nowhere near enough to get home. There was nothing for it but to stop and try to procure some more fuel from somewhere. “When we reached the first signalbox after the bridge, the traction inspector climbed down and had a word with the ‘bobby’ to let us into an engineers’ yard, where he knew there were some old wooden sleepers. There was a power saw in the support coach and we reckoned that would get us to Thornton. “However, we had reckoned without the night watchman. I don’t know whether he’d had a few drams or not, but he was swaying quite a lot and even though there was a huge steam engine standing in his yard, he was damned if he was going to let us have any sleepers. “I decided it was another occasion on which I had to pull rank, so I showed him my pass and informed him that I was the chairman… to which he replied ‘If you’re the bloody chairman of ScotRail, I’m the Pope’! “We were getting a bit desperate by now, so I told him I only wanted old sleepers, not new ones, and that I would give him a signed note to ensure that he didn’t get into trouble the next day, but he was having none of it. 61994 and 60009 crest Slochd summit on April 10 with the Perth-Inverness leg of ‘The Great Britain’ railtour. 1 o’ clock in the morning and got him to speak direct to this fellow. That did the trick. “The sight of us going up the bank via Dunfermline and Cowdenbeath after that must have been like Guy Fawkes Night with all the wood sparks flying out of the chimney! Another rather bizarre event took place when John invited British Rail chairman Sir Bob Reid and the entire BR board to a barbecue at his Scottish farmhouse… during which time he put on a sheep-shearing demonstration for them in the barn! (see picture). But perhaps the best-known of the many unusual occurrences that took place during his tenure at the head of Scottish railways was the one related to the re-naming of No. 60009 in 1990. At the time, there was widespread political opposition to the apartheid regime in South Africa and as the ‘A4’ had been booked to haul a special train in connection with a Commonwealth event, the Government was nervous that its name might result in protests if use of the loco was interpreted as implicit UK support for the regime. John was asked by his political masters if he would consider re-naming the loco, even if only temporarily. Union of South Africa was an identity the engine had borne since being built as LNER No. 4488 in 1937 and he didn’t really want to change it, but was coming under intense political pressure to do so. change of mind saw it enter traffic with its Commonwealth-based epithet. The Osprey name was later carried by classmate No. 4494 from 1937 to 1942 and then by ‘A1’ No. 60131 from 1950 onwards. As John owned the plates, he agreed to fit them temporarily to No. 60009, keeping them on until 1991 and thus providing another fascinating little episode in the engine’s long and colourful history. That wasn’t the only re-naming it underwent during his ownership, though. 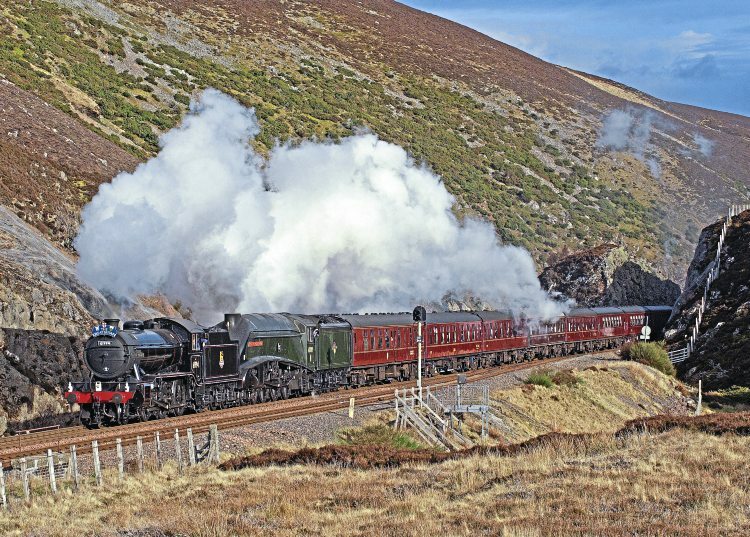 In February 1992, Deputy Prime Minister Willie Whitelaw was steam-hauled in Scotland to mark the 150th anniversary of the Edinburgh to Glasgow line and the nameplates and smokebox numberplate formerly carried by ‘A4’ No. 60004 William Whitelaw were temporarily affixed to Number 9 for the occasion. As a director of South West Trains in the 1990s and early 2000s, John chaired the operating company’s safety committee and was instrumental in acquiring diesel unit No. 55028 for route-learning duties. 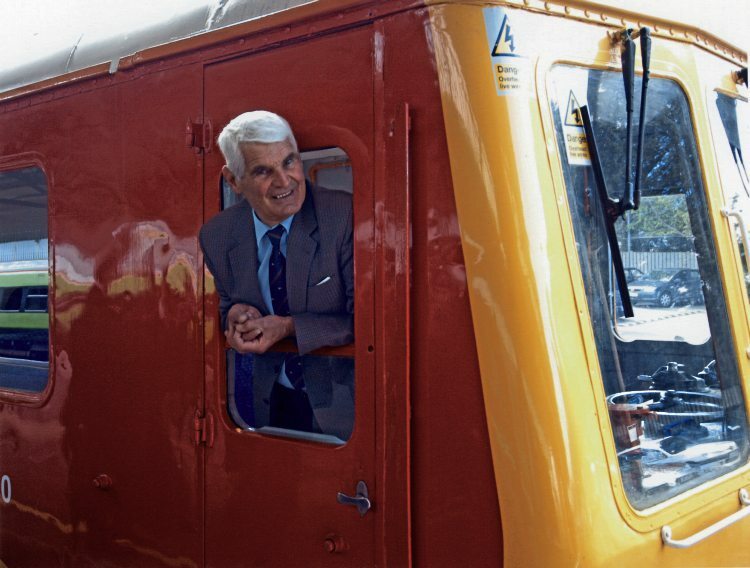 SWT honoured him by naming the unit John Cameron before his 2009 retirement from the company. In 1992, the Conservatives were re-elected to office with a mandate to privatise the railways and by the mid-1990s, BR was being dismantled and sold off sector by sector, but that didn’t signal an end to John’s life in the stratosphere of rail decision-making. 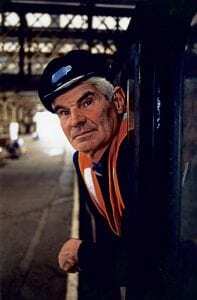 As his role at ScotRail was coming to an end in 1996, he received a call out of the blue from Brian Souter, owner of the Scottish transport company Stagecoach and a pioneer of rail privatisation, whose company won the South West Trains passenger franchise. He wanted the benefit of the ScotRail chief’s experience and so John was duly appointed a director of SWT and a non-executive director of Stagecoach Rail – plum roles despite the requirement to become an ultra-long distance commuter whenever his presence was required south of the Thames. first-generation ‘Bubblecar’ unit – No. 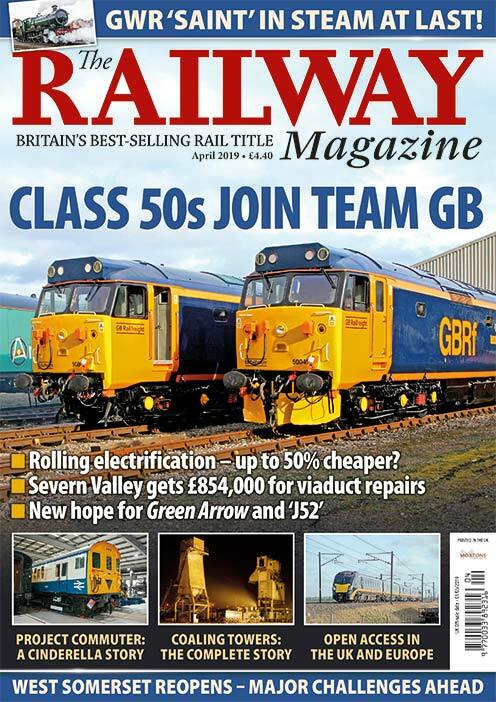 55028 – for route-learning and other duties. The company’s naming of this vehicle John Cameron in his honour was a nice way to mark his time in the Surrey and Hampshire stockbroker belt. Sir Brian Souter on board an Island Line train on the Isle of Wight. Today, John is enjoying semi-retirement back in Scotland having sold most of his farms a few years ago, retaining only the one he lives on. Now aged 77, but blessed with the enthusiasm and energy of a man half his age, he keeps himself busy managing and overseeing numerous railway and agricultural operations, and is also president of the Gresley Society. Knowing that time is no longer on his side, he is formulating plans in the back of his mind for the future protection of his two steam locomotives. “Margaret and I have no children, so I quite like the idea of setting up a trust and turning our home into an ‘open farm’ to enable agricultural students and the public to study livestock and arable practice,” he revealed. “If we were to do that, it would be nice to have a cafe and another form of attraction to bring in the visitors and so I’d like the locos to be preserved here as part of a small railway museum allied to the farm. 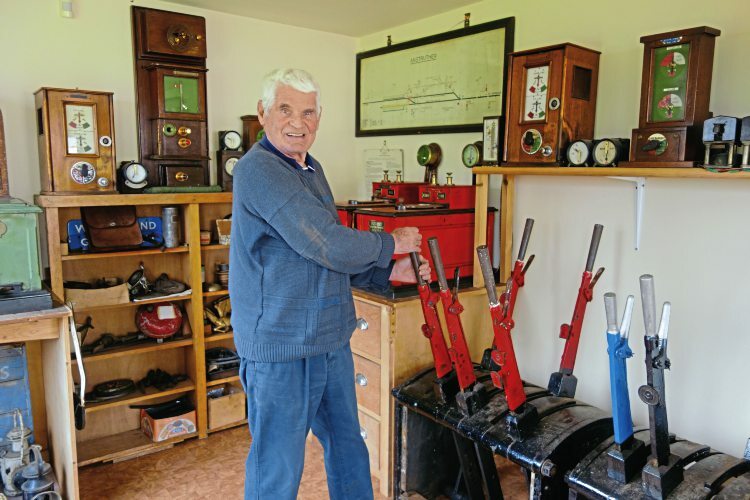 While working out the practicalities of such a venture, John enjoys spending time in a signalbox he has built in his garden. Bearing an ex-North British Railway nameboard from Dollar, where he spent his later school years, it houses a lever frame, several box instruments and track diagrams and enables him to spend sunny days ‘in the box’ gazing out over the Firth of Forth and imagining a ‘Scott’-hauled train is heading his way. Even after all these years and all his experiences, he still derives as much pleasure and enjoyment from railways as he ever has. He’s travelled the world, riding the footplates of trains in numerous countries (he and Margaret even keep a home on the shores of Lake Malawi) but he reckons that nothing compares with a day on the footplate of Number 9. 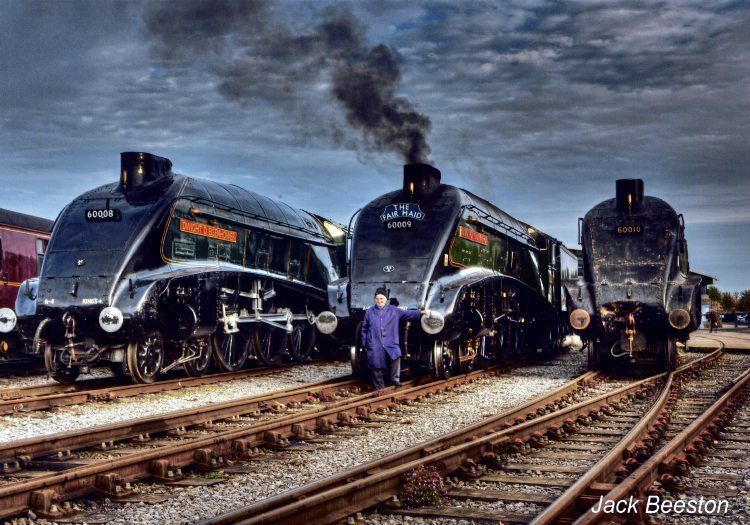 “To talk locomotives with people of like mind and escape back into the world of steam is an important part of my life,” he says.